A lamp stack is a collection of packages which can work together to build the web interface of your server. If this is your first time running this command, it may take a while however, this is a vital step to ensure Ubuntu has the latest bug and security fixes. You will probably be asked if you would like to continue with the installation. Just type ‘y’ and press enter. Your install of Apache will then start to begin. 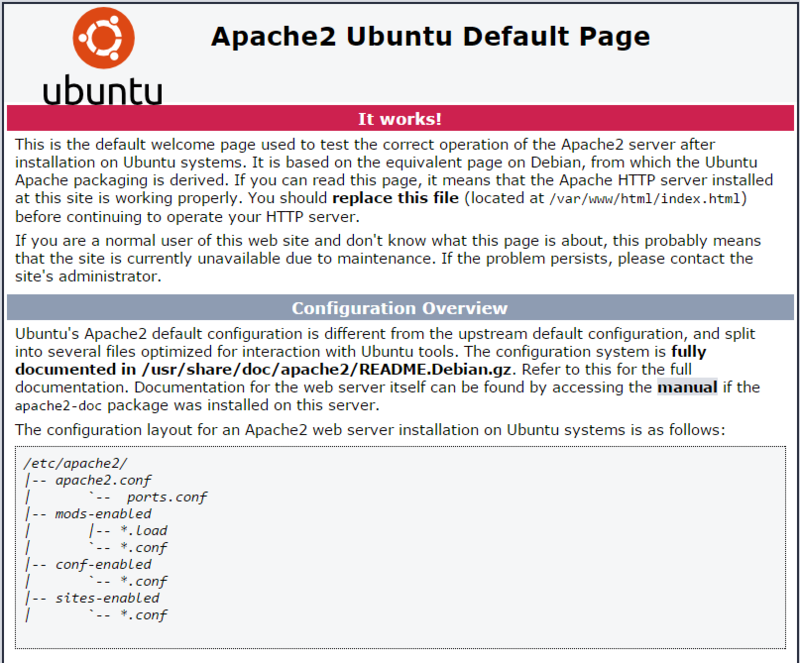 To check the installation went correctly, you should be able to view the Apache 2 Ubuntu Default Page by typing in your servers IP address into the browser. If you are greeted with a page which looks like this; Apache has installed correctly and we can continue. Again, MySQL can be installed via Ubuntu’s package manager. The following command will start the installation. You will be prompted with a ‘Do you want to continue?’ question. Like before, type ‘y’ and press enter to proceed with the install. During the installation you will be asked to set-up the password for the MySQL administrative ‘root’ user. Once you have entered your password, press enter to continue. A confirmation window will then show asking you to confirm the root password you had just defined. Again, enter the same password and press enter to proceed. To get our MySQL environment set-up completely, we’re going to need to enter a few more commands. You will be first asked to enter the root password for the MySQL root user. This will be the one which you set earlier in the installation. If you would like to change the root password you can enter ‘Y’ in the next step and follow the on screen instructions. If you are happy with the previous MySQL root password you setup you can safely answer ‘n’. Proceeding, you can just hit enter and use the default MySQL values. These are normally the securest. This will just remove anonymous user’s access to the database alongside disabling a root login remotely. You will be prompted if you would like to continue, you can answer ‘Y’ like before. This should install PHP and the selected packages with no problems at all. By default, Apache will look for index.html files first before any other file type. You can change this to ensure Apache looks for index.php files first. Finally, we will need to restart Apache. This will conclude the tutorial on how to setup a LAMP stack on Ubuntu 14.04. You will be able to create files in the default web root directory. This is found at /var/www/html/. You can then create files in that directory for Apache to serve.